Looking to get a new mower, but not sure which kind will suit your needs? Here’s a breakdown of mower types and what they’re best at. These are the simplest mowers, consisting of a deck with a motor that drives a single blade. They’re light, inexpensive and don’t use much fuel, but they can be tiring to use. For this reason, they aren’t practical for mowing more than half an acre. Most people are familiar with these residential models that add a drive system to a walk behind design. They have to be physically pushed to steer, but once lined up, the mower can push itself along the ground, lowering the effort needed to cut grass. Most models use multiple gears to keep the engine running at top speed to drive the blade while allowing speed adjustment, while Honda offers a model with a hydrostatic transmission, using fluid control for infinite speed adjustment. 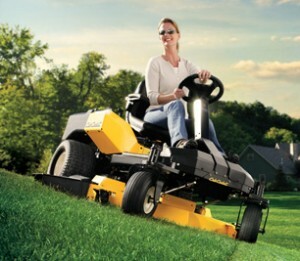 Commercial self-propelled mowers have steering systems and can support massive, multi-blade decks. Some models can be used with a small trailer called a “sulky” that the operator can stand on. These mowers can handle much steeper terrain than a riding mower or tractor, so they find favor with operators that have to deal with drainage ditches and other difficult terrain. Like a self-propelled mower, a riding mower splits power between the deck and drive system, which can be a traditional gearbox or hydrostatic. Sizes can vary widely from compact single-cylinder, single blade designs to three blade twin cylinder models. Likewise, they can be built to handle anything from one to 5 acres. The deck is floating, hanging from the frame to let it hug the ground. This also allows the height to be adjusted while operating. Unfortunately, a top-mounted engine, narrow footprint give these mowers a high center of gravity, making them difficult to handle on steep inclines. At first glance, these two types of tractors are hard to tell apart. A lawn tractor is intended principally for mowing with the option of some light duty attachments. A garden tractor is built for multiple tasks and has a beefed-up frame and large engine to support heavy-duty attachments. “Zero Turn Radius” (ZTR) mowers steer using a pair of hydrostatic transmissions, each controlling one wheel. By turning one wheel faster than the other, or even turning it in a different direction than the other wheel, the whole mower can turn. That complexity makes this the most expensive sector in the market, but the added flexibility can pay massive dividends to landscapers by reducing total mowing time. There are two kinds of ZTR mowers: front mount and mid-mount. By placing the deck under the operator, mid-mount mowers are compact, letting them get into tight spaces without sacrificing cutting speed. However, decks front mount mowers can more closely follow terrain for a cleaner cut, and they’re easier to work on. Like tractors, they straddle the residential and commercial markets. Residential versions usually do nothing but mow, but high-end commercial models can be equipped with attachments that rival the biggest garden tractors. Shank’s Lawn Equipment is your one stop shop for all of your lawn mowing needs. They sell and service a long list of brands including Honda, Exmark, Cub Cadet, Woods and Scag, covering everything from small push mowers to big ZTR’s. Stop by their shop, located at 4900 Molly Pitcher Highway in Chambersburg, just off route 11. To get there from I-81, take Exit 10 to Marion. Not in the area? They can still ship parts for your current mower. Just visit their website, www.shankslawn.com. This entry was posted in Uncategorized and tagged Lawn care, Lawnmower, mowers, Shanks Lawn Equipment. Bookmark the permalink.